During the academic year of their fourth birthday, children will move out of the Nursery into one of our two Pre-school classes. 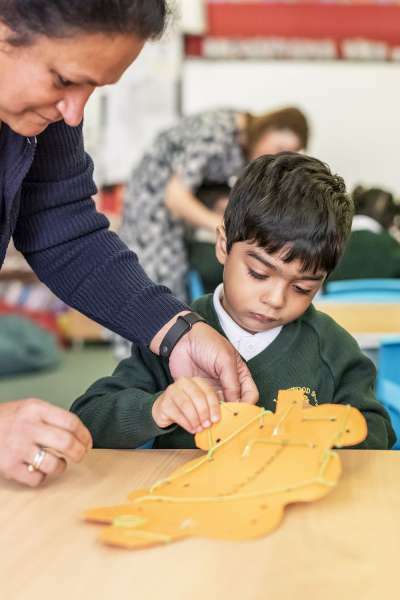 Their learning journey continues under the EYFS framework but now they become part of the School where the children wear an appropriate version of the uniform, are included in the house system and participate in school assemblies. Child-initiated and adult-directed activities remain an important part of the timetable. French, Music & Movement and Music, are delivered by specialist teachers. We endeavour to promote learning through well-planned, play-based activities and experiences. We try to keep a balance of formal and informal learning to help each child become confident and independent. The children receive a more structured approach to their pre-school education by following a timetable that includes music, French and PE. They will become familiar with numeracy and literacy skills which prepare them for a smooth transition into Reception. During the pre-school year parents can apply for a place for their child in our Reception class which they commence in the September following their fourth birthday.